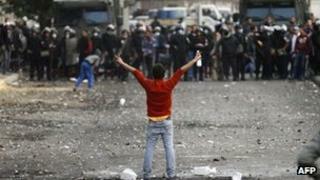 Two people have been killed in clashes between protesters and police in the Egyptian capital, medics have said. The two men were hit by gunshots on the edge of Cairo's Tahrir Square at dawn, reports said. One died at the scene and the second in hospital. More than 50 people have died in clashes in cities across Egypt in the past week, the deadliest violence since President Mohammed Morsi took office. Critics accuse him of betraying the revolution, which he denies. On Tuesday, Egyptian army chief Gen Abdul Fattah al-Sisi warned that the current political crisis could lead to the collapse of the state. President Morsi was meeting German Chancellor Angela Merkel in Berlin on Wednesday but has cut the length of his visit to a matter of hours because of the crisis, cancelling plans for a trip to Paris on Friday. In Cairo, scuffles continued in the early hours of Wednesday morning between police, who used teargas, and protesters, who threw stones at security officers. One man was fatally shot on Qasr Al-Aini Bridge and another was hit in Abdel Moneim Riyadh Square, according to a Health Ministry official. "Our demand is simply that Morsi goes and leaves the country alone. He is just like Mubarak and his crowd who are now in prison," 28-year-old protester Ahmed Mustafa told Reuters. Violence has spread to several Egyptian cities after beginning in Cairo on the eve of last Friday's second anniversary of the revolution. The worst of the unrest has been in the Suez Canal city of Port Said, in rioting prompted by death sentences passed on 21 local people over football riots. Mr Morsi's imposition of a night curfew in Port Said, as well as the cities of Suez and Ismailiya, have been largely ignored with tens of thousands of residents taking to the streets. In a Tweet, Nobel peace laureate and founder of the Constitution Party, Mohammed ElBaradei said the president needed to take steps to stop the violence. "We need an immediate meeting with the president, ministers of defence and interior, the ruling party, the Salafist movement and the National Salvation Front to take urgent steps to stop violence and start a serious dialogue," he wrote. Image caption Egypt's revolution began on 25 January 2011, the "Day of Revolt", when tens of thousands of marchers occupied Cairo's Tahrir Square to protest against President Hosni Mubarak and his government. Simultaneous protests were held across the country. In the following days, demonstrations became more violent, coming to a climax with running clashes in Cairo between pro- and anti-government demonstrators. Image caption Despite efforts by the authorities to disperse the protesters, they refused to move and set up camp in Tahrir Square. On 4 February, dubbed the "Day of Departure", hundreds of thousands of people demonstrated in Cairo demanding Mr Mubarak leave office. But it took another week for the president to accept his fate. He finally agreed to step aside on 11 February after protesters marched on the Presidential Palace. Image caption After Mr Mubarak’s departure, Egypt’s parliament was dissolved and the country’s constitution suspended. The Supreme Council of Egyptian Armed Forces declared it would hold power for six months or until elections could be held. But while major protests subsided, uncertainty about the country’s future meant many protesters continued to return to Tahrir Square, calling for their demands for change to be met. Image caption Tensions soon built between the pro-democracy movement and the new military leadership. Protesters were drawn again to Tahrir Square to press military rulers to keep promises on political reform. Demonstrations turned violent. However, despite the unrest, voting in parliamentary elections took place between November 2011 and January 2012, with the Muslim Brotherhood-affiliated Freedom and Justice Party taking almost half the share of votes. Image caption Newly-elected representatives of the People’s Assembly - parliament's lower house - met for the first time in January 2012 and the Supreme Council of the Armed Forces transferred legislative authority to them. However, a court later dissolved the assembly amid accusations that it was dominated by Islamists. Despite this, in May, voting began in Egypt’s first free presidential election, with the Muslim Brotherhood’s Mohammed Morsi declared the winner in June. Image caption The Islamist president’s first months in office were marked by political tensions and street protests. One of his first acts was to issue a decree overruling the court decision to dissolve parliament. The move effectively placed a panel tasked with writing the new constitution above judicial review. Amid public outrage, Mr Morsi later rescinded most of his decree, but still pushed ahead with a referendum on the draft constitution, which was approved in December. Image caption Opposition groups continue to accuse Mr Morsi and his Muslim Brotherhood backers of betraying the goals of the revolution. They want to see radical changes to Egypt's newly-adopted constitution, which they say fails to guarantee personal freedoms and rights for women and minorities. Parliamentary elections in 2013 are likely to set the stage for yet another electoral battle between surging Islamists and their fractious liberal and leftist opponents.